The brewing and beer wholesaling industry impacts almost every community in America. 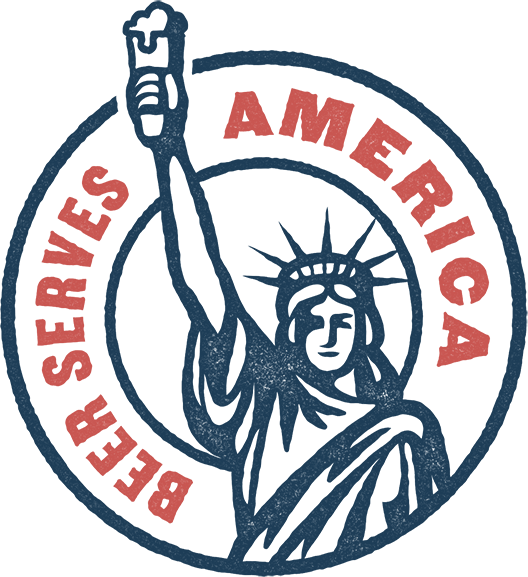 The Beer Institute is a national trade association for the American brewing industry, representing both large and small brewers, as well as importers and industry suppliers. First founded in 1862 as the U.S. Brewers Association, the Beer Institute is committed today to the development of sound public policy and to the values of civic duty and personal responsibility: www.BeerInstitute.org. Connect with us @BeerInstitute and on Facebook. The National Beer Wholesalers Association (NBWA) represents the interests of America’s 3,300 licensed, independent beer distributor operations in every state, congressional district and media market across the country. Beer distributors are committed to ensuring alcohol is provided safely and responsibly to consumers of legal drinking age through the three-tier, state-based system of alcohol regulation and distribution. To learn more about America’s beer distributors, visit www.AmericasBeerDistributors.com. For additional updates from NBWA, follow @NBWABeer on Twitter, watch NBWA videos on www.youtube.com/NBWABeer and visit www.facebook.com/NBWABeer. commercial activity & tax revenue. An economic study highlights that the vast scope of the U.S. beer industry – from brewers and beer importers to beer distributors to retailers – generates more than $350 billion in economic activity, nearly 2.23 million American jobs and more than $63 billion in tax revenue. Jobs, tax contribution and economic impact figures for each state can be found here. The Beer Institute and the National Beer Wholesalers Association (NBWA) released the Beer Serves America report to highlight the industry’s complete impact on the American economy. The study, based on government and industry data, examines direct, indirect and induced spending, labor and tax collection. Overall, the beer industry contributes more than $350 billion in economic output which is equal to nearly 1.9 percent of the U.S. Gross Domestic Product. Brewers and beer importers directly employ 64,745 Americans. About 58 percent of brewing jobs are linked to large and mid-sized brewers and beer importers. The number of distributor jobs has increased by nearly 24 percent over the past decade, to more than 134,240, according to the U.S. Department of Labor. Suppliers to the brewing industry – enterprises that manufacture bottles and cans, cardboard case boxes, brewing equipment or marketing displays, for example – generate almost $115.27 billion in economic activity and are responsible for more than 491,800 jobs alone. More than $63 billion in tax revenue is generated by the production and sale of beer and other malt beverages. On average 41 percent of what consumers paid at retail for beer went to a tax of some kind, including local sales taxes, consumption taxes, business taxes, and the federal excise tax on beer. Beer is an employment intensive industry in the United States. From barley growers to bartenders, from farmers to factory workers, the beer industry in the United States generated nearly 2.23 million american jobs in dozens of industries – manufacturing, agriculture, trucking, warehousing, grocery and the bar and restaurant business are just some of the most obvious directly related to brewers. All told, for every one job in a brewery or beer importer, another 33 jobs in other industries are supported. 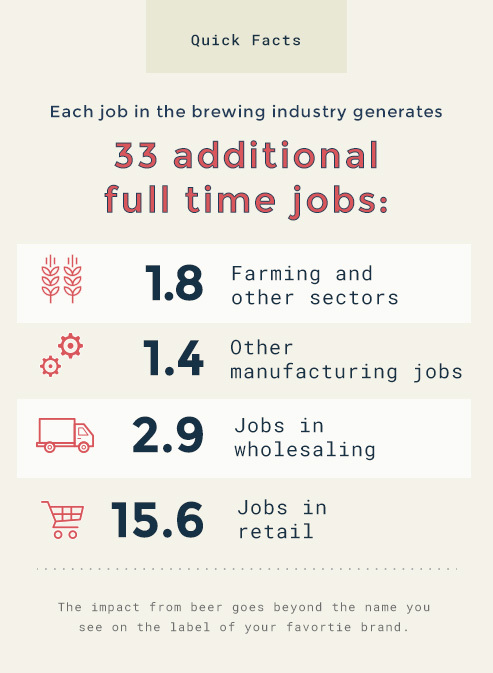 Beer Serves America is a careful examination of the total aggregate impact of these jobs, but also offers a snapshot of each of the employment categories – brewers and beer importers, wholesalers, retailers, suppliers and induced labor. The keystone of the brewing industry’s contribution, brewers and beer importers directly employ more than 64,745 Americans. About 58 percent of brewing jobs are linked to large and mid-sized brewers and beer importers. About 15,160 more people work in breweries than did in 2014. The wholesale tier of the industry directly employs more than 134,240 individuals throughout the country, moving beer from the brewers and importers to the retailers. This is up by nearly 24 percent over the past decade. Barley growers, hops producers, bottle- and can-manufacturers – all told, the enterprise of supplying brewers and beer importers with raw ingredients, packaging and other goods and services necessary to produce beer creates and supports another 491,864 jobs in the United States. The multiplier effect of the jobs in the beer industry cannot be overlooked. 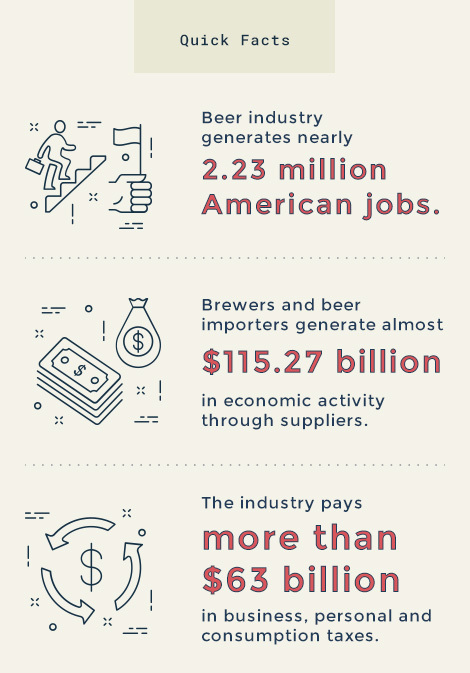 The companies and businesses that support the people and commercial efforts of the U.S. beer industry put another 621,340 people to work every single day. 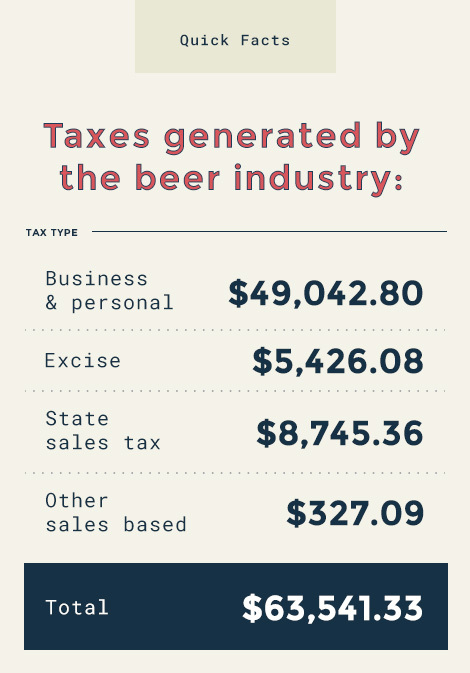 The Beer Serves America study estimates taxes paid by the industry and its employees and consumer taxes generated by the sale of malt beverage products. All told, over $63 billion in tax revenues are generated by the production and sale of beer and other malt beverages. On average 41 percent of what consumers paid at retail for beer went to a tax of some kind, including local sales taxes, consumption taxes, business taxes, and the federal excise tax on beer. Beyond the numerical indicators of brewers' economic activity there is another powerful story. The brewing industry has a presence in every congressional district in the country, and family names appear on most beer packages sold in the United States. Beer Serves America is a biennial economic impact study commissioned by the Beer Institute and National Beer Wholesalers Association. The U.S. brewing industry is a dynamic part of our national economy, contributing billions of dollars in wages and taxes.